While photography has historically played a pivotal role in turning public opinion against war, colonialism, and environmental devastation, it has seldom been used to document the environmental harm wrought by the very presence of US bases. This is not only because the effects of environmental risk are frequently invisible, but also because photographing or otherwise visually representing US bases in the absence of censorship is prohibited by law (18 USC 795). Because military and naval authorities censor “any photograph, sketch, picture, drawing, map, or graphical representation of…vital military and naval installations or equipment,” photographs can only indirectly represent how these militarized spaces affect environment and health. Greg Girard, Camp Foster (US Marine Corps) Commisary, Okinawa, Japan, 2008. In 2008, Canadian photographer Greg Girard received permission to photograph over twenty US bases in South Korea, Japan, and Guam. While it hardly depicts military equipment at all, the resulting project—”Half the Surface of the World“—sheds light on the environmental incongruities of bases in the US Pacific Command (“PACOM”)—an area delineated by the Pentagon that covers approximately half the planet. Thirty years after he visited US bases in Japan in the 1970s, Girard “was struck by how little life had changed on the bases…” (Girard 2011). Girard’s photographs depict suburban sprawl, immaculate roads, grocery stores filled with packaged foods, shopping centers filled with sofas and appliances, and other indications that life on offshore bases is not so different from life in a 1950s US suburb. Even without depicting military exercises or weapons, Girard provides a stark picture of the environmental carelessness with which the Department of Defense exports and sustains modes of suburbanization and consumption incongruous with local living arrangements in places like Guam, South Korea, and Japan. 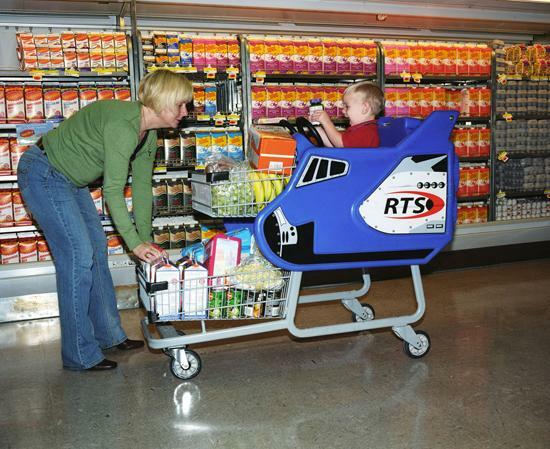 While processed foods, suburban housing patterns, and car culture are criticized in the US by environmentalists, planners, and public health advocates, offshore bases continue expending public funds to export and propagate such patterns of consumption. Indeed, recent efforts to privatize the US military have led to a dramatic increase in obesity among US soldiers stationed in Iraq as the sustenance of soldiers is contracted to fast food corporations (Ventura 2012). Researchers’ objections to a proposed base in Vicenza, Italy, help contextualize the public cost of US bases: “Some studies have shown that the base, designed to house 2,500 soldiers, will consume an amount of water equivalent to the need of 30,000 residents, as much natural gas as used by 5,500 Vicentines, and electric power equal to the consumption of 26,000 inhabitants” (Palma 2012, 840). Girard’s photographs quietly register the sprawl, consumption, and waste that sustain these bases from which the US projects power across “half the surface of the world,” exposing a geographically and socially remote landscape taken for granted by most US residents: “I consider this something that’s basically hidden in plain sight” (Greg Girard, quoted in Macdonald 2012). Greg Girard, Camp Foster Marine Corps Family Housing, Okinawa, Japan, 2008. Greg Girard, Camp Rodriguez Tank Training Range, Korea, 2008. 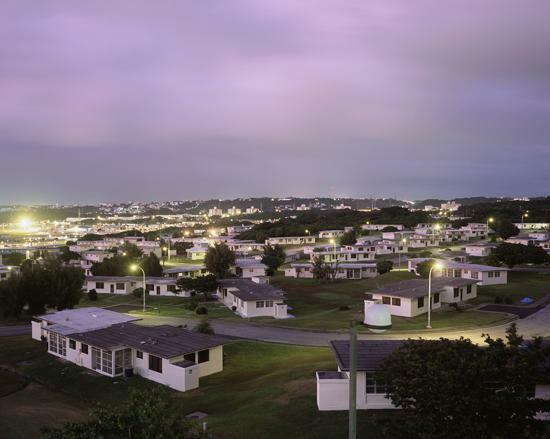 Whereas photographs such as Camp Foster Marine Corps Family Housing, Okinawa, Japan, 2008 convey a sense of monotonous, standardized homes superimposed upon the Okinawan landscape, Camp Rodriguez Tank Training Range, Korea, 2008 presents a different context of repetitive development. 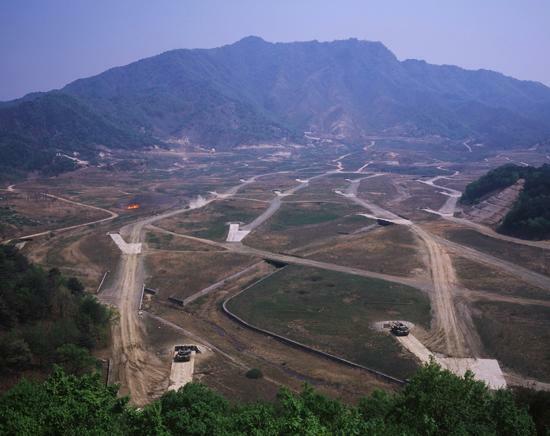 Here, the Korean countryside is fenced off and razed to make room for tanks, not homes. In addition to the uninhabited and monotonous appearance of these training grounds, several craters and a small fire in the distance bear witness to a violent transformation of nature: training troops to devastate enemy landscapes requires the continuous devastation of friendly terrains. When juxtaposed with Girard’s photographs of family housing, shopping areas, parked cars, movie theaters, and manicured lawns, his images of tanks, bombers, and training exercises remind us of the violent enterprises that support suburban US practices of “peaceful,” middle-class consumption. 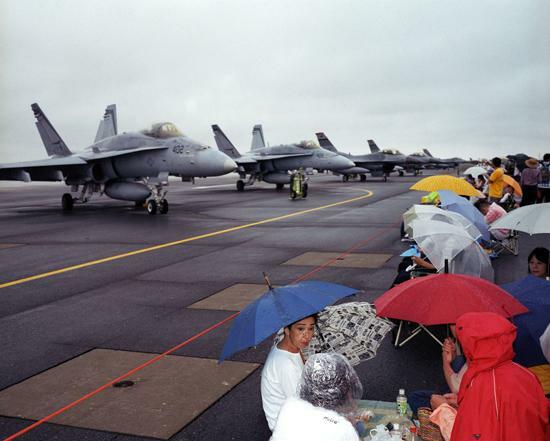 Picnic on Flight Line, Misawa Air Base, Japan, 2008 condenses these incongruities into a single image, contrasting the idyllic associations of an outdoor picnic with fighter jets pointed at the picnickers. Along with the bleak, militarized landscape, the umbrellas suggest that this is not an ideal place to sit down for a meal. And all of this raises the question: What is the relationship between machines of mass destruction and community rituals of socialization and nourishment? Are these people sitting before these fighter planes by choice or by coercion—and is there anywhere else for them to go? Greg Girard, Picnic on Flight Line, Misawa Air Base, Japan, 2008. “Half the Surface of the World” uses carefully composed photographs—and the tensions produced by juxtaposing different photographs—to present chilling connections between military violence, suburban domestic spaces, racialized labor, mass consumption, and the physical and social environment propagated by US foreign bases. The bleak landscapes and interiors depicted in this series expose the environmental depredations wrought not by war but by housing, training, and maintaining military personnel. Living in unsustainable automobile-oriented housing developments, fed on processed foods, and entertained by wide-screen televisions on offer at commissaries and exchanges, military personnel reproduce a culture of consumption premised on endless accumulation and, it seems, interminable war. Arden, Roy. “Greg.” Foreword for Greg Girard, Half the Surface of the World. Exhibit catalogue, Clark & Faria Gallery. Toronto, 2009. Girard, Greg. “Greg Girard: Half the Surface of the World.” Leap: The International Art Magazine of Contemporary China. June 10, 2011. Macdonald, Kerri. “Uncovering a Home Away from Home.” New York Times, January 25, 2012. Palma, Marco. “No Dal Molin: The Antibase Movement in Vicenza.” South Atlantic Quarterly 111, no. 4 (2012): 839–46. Ventura, Patricia. “Fast Food Nation-Building: Neoliberal War, Necropolitics, and Lateral Agency in Iraq.” Conference paper presented at American Studies Association. San Juan, Puerto Rico. November 2012.